The judge said there was a “real” possibility that Pell may not live to be released from prison, and that he had considered the cleric’s age and health in sentencing. Judge Kidd added that Pell should not “be made a scapegoat” for wider failings within the Catholic Church. In an unusual move for local courts, the lengthy sentencing was broadcast live – in what officials said was a commitment to “open justice”. 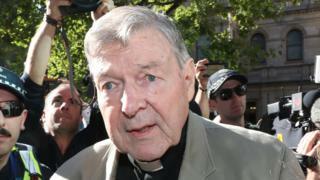 How will Pell appeal the verdict? His lawyers argue that the jury’s verdict was “unreasonable” because it relied too heavily on the testimony of one person – the surviving victim. They have also asserted that Pell was wrongly prevented from entering his plea before a jury, and that a defence animation should have been allowed as evidence at the trial. A court will begin considering the appeal on 5 June.